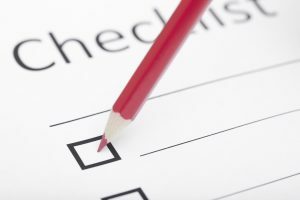 A bindery checklist is helpful for your business. Checklists can’t completely replace basic training. But supervisors won’t need to hold the hand of operators for too long if checklists are arranged beforehand. Especially for complicated, time-consuming tasks, a checklist is supremely helpful in getting things done. No matter how experienced the worker, checklists always help. Training can be expedited by having a good checklist in order, so workers know exactly what to do and how to do it. Checklists can also help improve efficiency and communication. Better, quicker ways to accomplish something will presumably develop once a basic checklist is in place long enough. These can eventually be noted on said checklists. More details and helpful tips can be communicated through improved checklists. Nothing can be overlooked, and should not be. Helping one another catch the little things is a vital link in communication, especially to help make sure everything gets done on time as it should. Also, be sure to keep bindery equipment clean for better efficiency. Many kinds of safety features are built into contemporary bindery equipment. These safety features were requirements set forth primarily by the government body OSHA. In order to prevent serious injury, a bindery checklist should be added as another safety feature. These checklists can note the steps to avoid injury to future operators. Preventing these mistakes helps protect employees and employers alike. Another way bindery checklists can be excellent tools is improving decision making. For those times when managers or customers are not around to answer questions, bindery checklists can stand in their place. Bindery checklists, particularly those with “If X, then Y” items can prevent slowdown and lost productivity. No frantic phone calls will be needed. The best way to keep checklists economical is to limit them to one page each, and modify and update them as needed. This entry was posted on Friday, February 10th, 2017	at 12:51 pm	and is filed under Blog, Equipment handling, Printing tips	. You can follow any responses to this entry through the RSS 2.0	feed. Both comments and pings are currently closed.